For the most part, you can follow the tutorial we posted back in December: http://blog.modk.it/2012/12/happy-holidays-modkit-micro-open-for-all.html But we do want to highlight an important improvement to the board auto-detection. In the previous tutorial we assumed you were using an Arduino Mega 2560 or Arduino Uno which should be autodetected right out of the box (assuming you preinstalled the drivers). But what if you're using a different board? 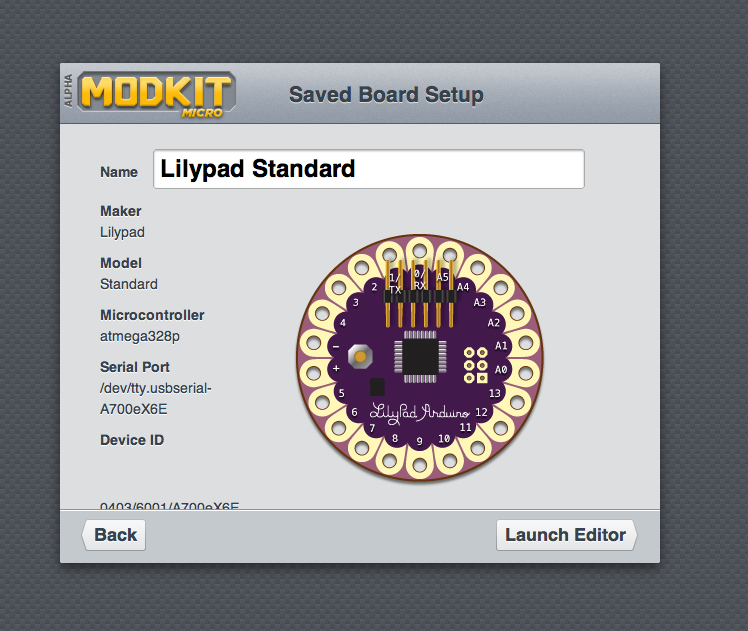 In this example let's assume you're using a Lilypad sewable electronics kit and that you installed the FTDI driver from http://modk.it/download. The first time you connect the board, it won't auto-detect so you'll need to "choose board from list." You can then pick your particular board from the growing list of supported boards. 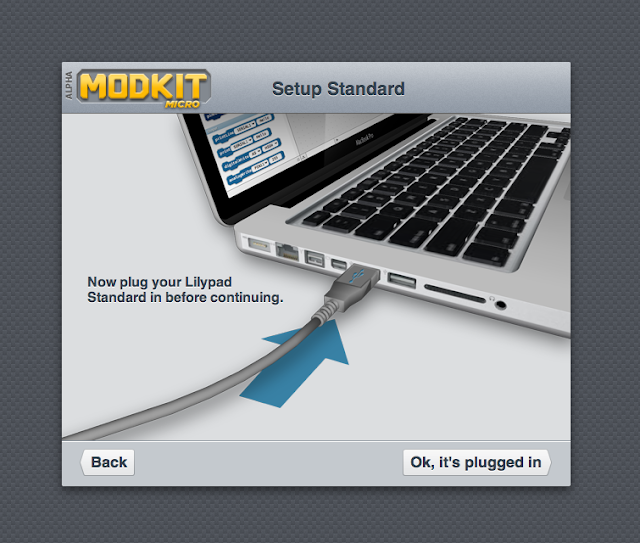 You could then skip into the editor just to play around, but we'll choose "Setup Board Now." You'll then plug your board back in. 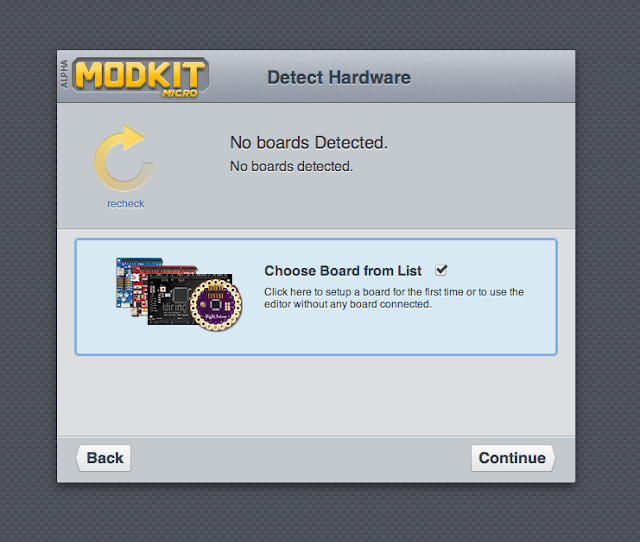 This helps Modkit determine which board you're configuring. You'll need to wait a bit for your board to be detected and stored on your computer. 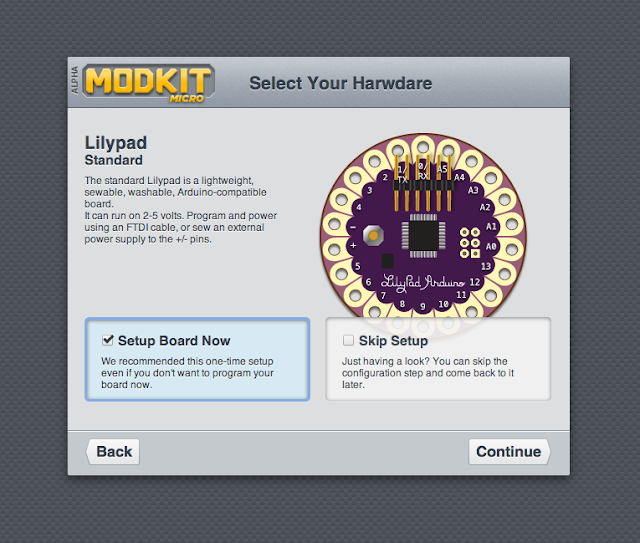 You may need to repeat these steps but if all goes well, you can launch into the Modkit Micro editor. The next time you open the editor, Modkit should auto-detect your board. 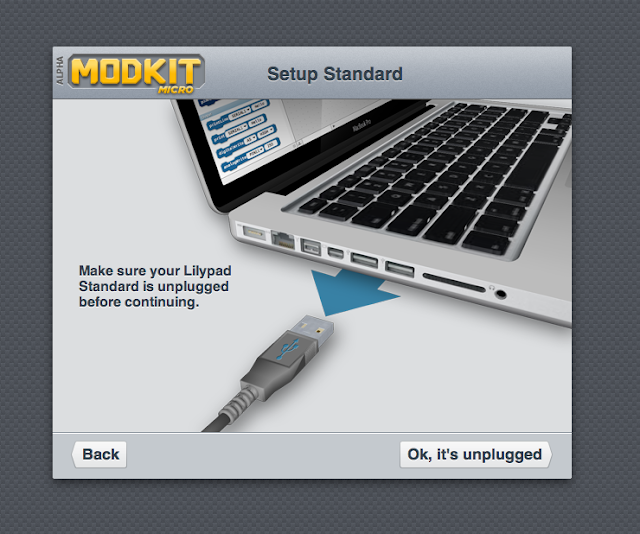 For further instructions please see our previous post: http://blog.modk.it/2012/12/happy-holidays-modkit-micro-open-for-all.html and as always, please leave us any feedback in the comments below. If nothing else, just leave us a quick note with the board you're testing and how it all worked. Where is the link for the new desktop version? I do not see it on the Alpha page or in the KS message that was sent. 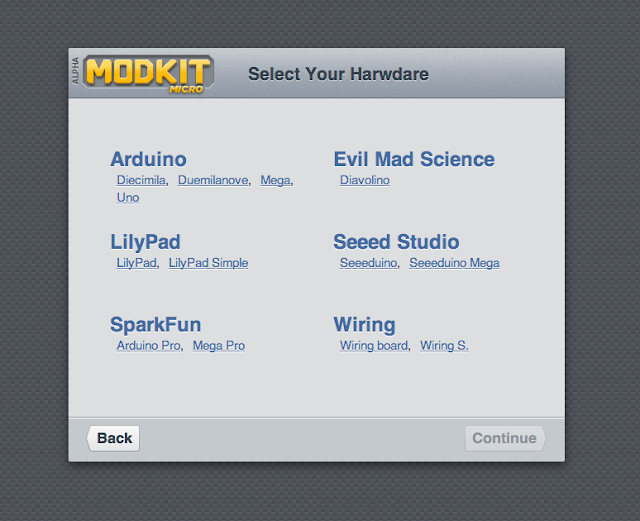 There is only a link to download the new Modkit Link version. 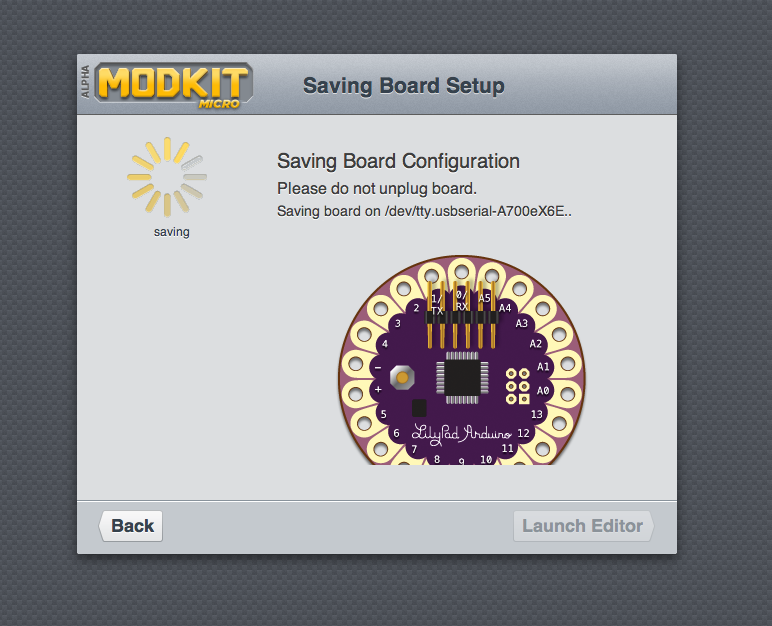 The new Modkit Link seems to be working well for me and I am able to upload larger sketches to my Arduino now :). Thanks. We'll resend the kickstarter message with the right links. The alpha page only shows it for recent alpha club members as we've been handling kickstarter through the messages you mentioned. Thanks for the quick response. Got the update and made a quick laser tripwire project using the desktop version. Worked flawlessly. Great. Thanks for keeping up with the progress. I just would like to know what you are planning on your future release. Maybe support for Serial? WOW! Really cool! I would really like to order this, or at least join the online version! Too bad your web site is broken and I can't... Sent an email and...no response. Hello...Hello...anybody out there...read your support email please. Does auto detect mode work with arduino ethernet (the board, not the shield)? Hi DMC - sorry we aren't set up to get alerts when someone posts a response here (and don't see where to set that up) but we did solve the issue with signing up. Thanks! Hi Riccardo - From the Arduino Ethernet page: "based on the ATmega328 ... The 6-pin serial programming header is compatible with FTDI USB cables and the Sparkfun and Adafruit FTDI-style basic USB-to-serial breakout boards." So it looks like this would make it compatible with the Duemilanove. If you pick that, it should remember the setting. Let us know wither way! How can we help to improve this amazing tool??.. When is the modkit available for TI MSP430? Network Cables render it simple to connect with all the device accessory target on your Local Area Network ( LAN ) . This prime quality wire is best to utilize with 10Base-T , 100Base-T & Gigabit Ethernet Coverage. Guys, I put everything correctly on that simple example ;but when I click to " play " button it writes to me " error "... How can it be possible ? I have done everything as that tutorial :( Someone would help me plz ? thanks. The Dueltek CAT6A wire array have been built with double shielding for you to insulate and forestall disturbance. Every person garbled couple can be foil guarded, prior to entire wire package deal can be bandaged using a additional braided line defend. Never apply for a new line of credit for more cash than you can sensibly pay back with your paycheck. There are numerous banks that tend to offer more than what you're requesting that since you'll battle pay them immediately. That implies that can gather more expenses from you when you move over the advance. Attempt to get a payday advance via telephone. While applying on the web may appear to be simple, it is typically better to call for more data. Not exclusively would you be able to ask any inquiries you have, you can likewise ensure you see every one of the terms and states of the credit.
. That’s why we feel you much and services. It is very easy to finding us as we are at your city or nearest places. Just remember us and we will cash your check very short period with a very low cost. That was a really good read. would like to see more.